Akame 48 Waterfalls (赤目四十八滝) is one of the popular tourist spots of Kinki located in Nabari, Mie Prefecture. In the 4km long small valley, there are many beautiful waterfalls and these waterfalls are designated 100 best Japanese waterfalls as Akame 48 waterfalls. It was used to be the Shugendo Practice place and Ninja also practiced here. Admission: 400 yen for adult. 200 yen for under junior. The round trip takes more than 3 hours. 1. use Iga Line to Iga Godo Station. 2. use Kintetsu Osaka Line to Akameguchi Station. Akame 48 Waterfalls is one of the Heisei 100 Best Waters, 100 Best Waterfalls, 100 Best Forests and 100 Best Strolling Trails. 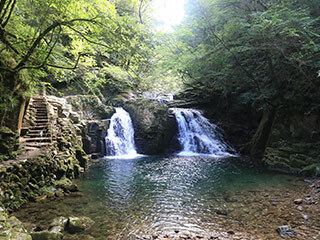 It is a small valley with many waterfalls located in Nabari, Mie Prefecture. It is about 4km long and there are many waterfalls. It was used to be the practice place for Shugendo and Ninja. It is also a nice hiking place and has a beautiful Autumn leaves at Falls. 15m tall and 7m wide. 15m tall and 4m wide. 6m tall and 3m wide.